in Gilbert Road." I'm second from the left. Several times I've written on the blog about Groningerstraat in Assen, and sometimes mentioning the way that this street shows how Gilbert Road in Cambridge, a road which used to be part of my cycle commuting route when I lived in the city, ought to have been developed. The interesting section of Groningerstraat is 1 km long, while Gilbert Road is about 100 m longer. Both are main routes for cyclists. There is a secondary school (age 11-17) on both roads. Both are on routes to primary schools (age 5-10). Both are also used as through routes for cars. Most importantly, the widths of both roads are almost exactly the same. So what is done in one could so easily also be done in the other. I wrote an article about it for the Cambridge Cycling Campaign newsletter, and they published it a couple of days ago, edited for length, though space was found for three other articles which disagree with me. I have to say that it does amuse me a little that Martin makes a case that removing trees would especially have been a problem in Cambridge. There is no reason why this should be so. In fact, it seems that roads in the Netherlands always become greener when they are transformed. Assen has a policy of maintaining green spaces which has no equivalent in Cambridge. Cambridge has a higher cycling rate than any other city in the UK. What Cambridge does is followed by other cities, and what Cambridge's campaigners do is followed by other campaigners. The Cambridge Cycling Campaign has recognized that Gilbert Road is a problem for a very long time. In August 1999, Kevin Bushell wrote of being a "long suffering user" of the road in an article in which he thanked the council for that years minor improvement - the addition of advanced stop boxes. In the same article, Clare Macrae discussed the possibility of making the existing advisory cycle lanes mandatory "in the hope of stopping cars parking in the lanes just when they are most needed." Two newsletters later, Clare reported on the outcome of a meeting to discuss Gilbert Road: "One thing was very clear – many, many people are very concerned about the increased speed and volume of traffic on Gilbert Road. Towards the end, councillors held a vote on whether people were in favour of improving cycle safety, by making the cycle lane mandatory. The response was overwhelmingly in favour, with only four 'no's. However, people seemed to want more imaginative solutions to their traffic problems than just mandatory cycle lanes." Fast forward to 2011 and what do we see ? The "more imaginative solution" is no-where to be seen. The advisory lanes are a little wider, though still advisory. There is a car parking restriction now and some people have reported that this makes road much better for cycling now. However, how effective this measure actually will be is something we will only really know in the future. In other places in Cambridge parking is a long term problem despite it being illegal, including outside the shops in Milton Road just around the corner from Gilbert Road. The problem with this scheme is its lack of ambition. The campaign asked for little more than was built. No-one really ever asked for a "more imaginative solution" as discussed 11 years earlier. What's more, a lot of time and energy was expended in opposition with local residents who didn't want to lose their on-road car-parking spaces. The last thing that cyclists need is to be placed in opposition with motorists and residents, who actually we could do with having on our side when redevelopment is called for. In 2008 we hosted a Study Tour in Assen which was attended by several campaigners from Cambridge. I showed them a street here in Assen, Groningerstraat, which is striking in its similarity with Gilbert Road. It has traffic lights at either end and another set in the middle. There is a secondary school part way along, as well as it being on the route to primary schools. It is also a popular commuting route by bike. However, the similarities end when you see what has been done with the road. In Assen we have a segregated cycle path on both sides of the road, 2.5 m wide in most places, 4 m wide in some places. Cyclists are kept apart conflict with both pedestrians and drivers, increasing both actual and subjective safety for everyone. At junctions, cyclists have priority over every side-road. At the traffic lights, the junctions allow cyclists to save time by safely and legally making right turns on a red light (equivalent of left on red in the UK), and two out of three of them also use the "simultaneous green" system for cyclists. This lights up green twice as often for cyclists on the cycle paths as for motorists on the road. The result is that you can make much more efficient journeys by bike than by car along this road. What's more, on-road car parking was preserved for a large proportion of residents, avoiding planning conflict with residents, or creation of an "us and them" attitude between motorists and cyclists. Yes, there is room for all this. It was achieved in a road was measured by Cambridge Cycling Campaign committee members as being almost exactly the same width. And yes, it's affordable too. It cost less from Assen's cycling budget to transform Groningerstraat than it cost in Cambridge to do the much less ambitious work in Gilbert Road - though perhaps the different contractors used for the two jobs have some influence on that. I'm left with wondering why it is that photos and videos of this road, which provides an excellent live example of what Gilbert Road could have become, were not used for campaigning in Cambridge. This type of infrastructure has many benefits for cyclists, pedestrians and drivers. For the Netherlands it's fairly ordinary, but in the UK it would certainly have been a "more imaginative solution". Why were horizons limited to just different versions of quite narrow on-road cycle lanes ? Why was a conflict with residents over car-parking spaces ever an issue ? What has been achieved in Gilbert Road is an incremental improvement, but not nearly the best possible outcome. If progress is to be made in cycling then campaigners need to start asking for the best, not watering down their proposals before even approaching the council. Publicity and support are required. If the schools, residents, cycling campaign members, the CEN, the councillors etc. had all been shown a proposal which would keep cyclists safe, keep school children safe, preserve car-parking spaces, and also result in a neat and tidy appearance, who would have been against ? The campaign could have included visiting the model for the proposed road here in Assen so that people could experience it for themselves, on a bike, by foot and in a car. Why not ? If any place in the UK can make the move towards a higher standard of infrastructure design for cyclists, it is surely Cambridge where there is the highest rate of cycling in the UK. However, the ambitions of British cyclists, and of the Cambridge Cycling Campaign, simply are not high enough. As a result, cycling remains a minority pursuit in the UK. It simply won't achieve the status of "normality" amongst the majority of the population until it is made as easy, as convenient and as safe (both subjectively and in actuality) as it is in the Netherlands. I welcome the start of the Cycling Embassy for Great Britain, as this group will complement the existing campaign groups in the UK while also campaigning for real change in the way that infrastructure is viewed. And that's the end of the article. There is a difference here in what is considered to be the best way forward. I have argued for many years that there needs to be a more strategic view amongst cycling campaigners. That people need to be shown what is best so that a decision can be made with more information. Campaigners need to have vision. Fighting little battles over minor issues repeatedly does not make progress. In the worst cases, inadequate improvements can set bad precedents. There are already people posting photos of cars parked or driving in the cycle lanes in Gilbert Road, after the ban. Not to mention that buses can stop in the cycle lane. The Dutch approach has been extremely successful. It's worth trying to emulate. However, while campaigners are too timid to even ask for best practice, there is no chance of achieving it. I recently wrote more about not aiming too low when campaigning, and also about that issue of trees. I should make it clear that I don't think there was any subterfuge involved in editing out selected paragraphs of my article. Space is limited in a printed newsletter, perhaps more so than usual in this issue of the newsletter which included three articles to disagree with my edited text. 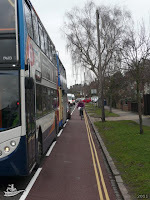 Other blog posts explain why on-road cycle-lanes are not a good solution for cyclists. And they had at least 2 goes at providing objections to your opinion. As far as I could see they seemed to be claiming as problems many of the items that your suggestion said were handled. e.g. the parking. The only one I could see that was valid was the existing mature trees - it is very likely that residents and others would object and would not be pacified by the idea that new trees could be planted. I don't understand why people think that a UK cycleway has to give way at every minor road. It doesn't and there are quite a few UK examples to prove it e.g. in Stevenage & Chelmsford. I agree that UK cycle campaigners are often unambitious and self limiting. I also agree that coming into conflict over car parking is daft as it simply cannot be won and in this case seemingly didn't need to be fought. Do the Dutch have the same attachment to old trees that is prevalent in the UK? I do understand the concern about the "normal" out-of-carriageway cycle paths (having to give way), but agree wtih OldGreyBeard that I never understand why this is mentioned as a reason for not asking for Dutch style paths - by definition they should not give way at driveways and side roads. So what they probably mean is that they fear that the implementation will not be up to the standards of dutch cycle paths and be worse than an on road lane. Which is a valid concern, but is often not how it is phrased. Neil, OldGreyBeard: The trees are a problem, but actually the Dutch are just as keen on trees as the British are. Assen is a very green city. There are three areas of woods within the city boundary, and all the residential areas have plenty of trees. We see them out of every window in our home, for instance. The policy here is that the city must become greener, and this means that any tree cut down must be replaced by two more. What's more, this is not only about appearance but also in such things as that it must become "carbon neutral" in quite a short time-frame. It's all far more ambitious than Cambridge, where outside of the parks there are fewer and fewer trees. Of course, Cambridge residents face the prospect that "their" trees might be chopped down and never replaced. It happened in Milton Road, for example. However, neither this nor the fear that proper standards won't be adhered to are good reasons for campaigners to water down their demands and not at least show people what best practice is, and ask for the same. In the case of Gilbert Road, with its bad record on safety, it was also a good opportunity to re-frame the debate so that it was not just about "cyclists" vs. everyone else, but about the safety of the many school-children for whom this is part of the route to school. This is what worked in the Netherlands to change attitudes. "the ambitions of British cyclists, and of the Cambridge Cycling Campaign, simply are not high enough." I'm afraid this is true. 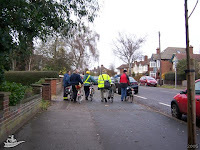 British cycle campaigning often gives the appearance of being a hurricane of activity but it is ineffectual because it is largely devoted to trying to make things a bit better for cyclists sharing the roads with traffic. That always fails because most people won't cycle in traffic, and even where cycle lanes are painted on the road surface drivers ignore them, both legally and illegally. British cycle campaigners lack vision and many seem grossly ignorant of what has been achieved in the Netherlands. It never ceases to amaze me that London is frequently cited as a place where the streets are 'too narrow' for the kind of cycling infrastructure which the Dutch enjoy. We in the Peoples Cycling Front of South Gloucestershire do have the ambitions. The problem is the moment those ambitions hit the council you come up against the inability of the councillors to care, the fact that even the cycle team are form of damage limitation. Nobody Cares. The cycling campaigners are too busy firefighting the tactical problems of near-death junctions to get involved in the strategic one "an infrastructure that works" -even though the latter is the only solution. The big question is: how to get the councillors to care. Our plan is simple, replace the councillors. - this statement can be applied in the UK all too often.